The GamePort is a device port to connect 3rd-party controllers [such as Joysticks or GamePads] to computers. It used to be a physical, serial connector [often found on sound cards]. Nowadays, it is mainly implemented in Microsoft Windows as software interface to connect such game controllers simply via USB. ▪ The GamePort supports up to 32 individual buttons and up to 6 axes. ▪ A maximum of 16 GamePorts can be used at the same time as per DirectX. ▪ Using buttons directly translates to DMX data in MADRIX [button off = DMX value 0; button on = DMX value 255]. ▪ Using an axis directly translates to DMX data in MADRIX [axis center = DMX value 127; axis one direction = DMX value 0; axis opposite direction = DMX value 255]. 4] Set up DMX Input. 5] Choose how to use incoming data. ▪ Connect your controller to the serial GamePort of your computer or to a free USB port. ▪ Make sure that Windows recognizes the device and install drivers if necessary. ▪ Calibrate your controller. This will ensure that all buttons and axes work properly. It is important to have calibrated and centered axes. ▪ Click if your device is not shown in the list. ▪ Now, in the list the State will switch to On [indicated by green light]. ▪ MADRIX will now receive DMX data via your controller. D] You can monitor incoming DMX data in the DMX Watcher. 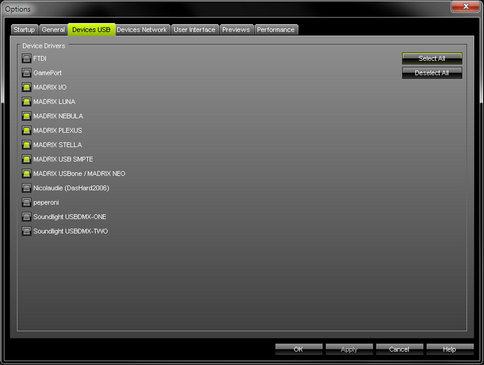 Select your device in the list and click Watch Universe... Learn more below. To effectively work with incoming DMX data from your controller, you can use the DMX Watcher to monitor incoming signals. Learn how to read the data in the tables below. - This is the same number as you have chosen in the list under Preferences > Device Manager... > DMX Input [e.g., Universe 1]. 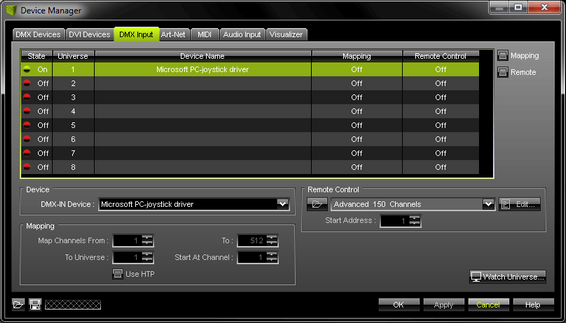 ▪ Channels 1 to 32 will display incoming DMX data for up to 32 buttons of your controller [DMX value 0 = Off or 255 = On]. ▪ Channels 33 to 44 will display incoming data for up to 6 axes. Each axis is divided into two directions on two DMX channels. This shows the deviation of the axis towards the center position [e.g., channel 33: left to center and channel 34: center to right]. A DMX value of 0 shows that the axis is located at the center. A DMX value of 255 shows that the axis is fully moved in the one direction. ▪ Channels 49 to 60 will display incoming data for up to 6 axes. 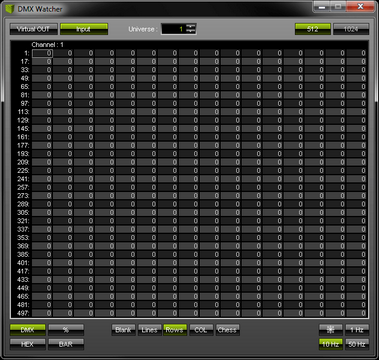 Incoming DMX data is separated into two DMX channels, the main value and a decimal place. Because of this, both channels can be seen as one value. A value of 127.0 [e.g., Channel 49 and Channel 50] shows that the axis is located at the center. A DMX value of 0.0 shows that the axis is fully moved in one direction [e.g., left], while a DMX value of 255.255 shows that the axis is fully moved to the opposite direction [e.g., right]. The following chart shows which function is assigned to which DMX channel, starting with DMX channel 1. Valid values are 0 or 255. Shows the deviation of this direction towards the center position. The further away from the center, the higher will be the DMX value. Valid values range from 0 to 255. Shows the deviation of the opposite direction towards the center position. The further away from the center, the higher will be the DMX value. ▪ Channels 33 to 44 divide each axis into two DMX channels. ▪ Channels 49, 51, 53, 55, 57, 59 will show the main value of an axis and thus represent each axis as one value. ▪ Regarding axes, some joysticks may only use the decimal place due to technical reasons. Then, the main value might not be useful to you and you should use channel 50, 52, 54, 56, 58, and 60 instead. 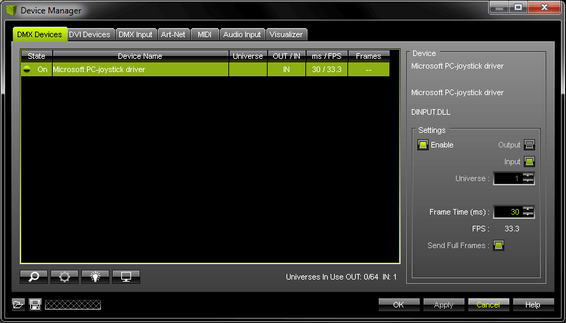 ▪ If you are using more than 1 controller, channel 65 to 124 will be used for the second controller, etc. ▪ Buttons 1 to 6 are not pressed . ▪ Button 7 is pressed . ▪ Buttons 8 to 32 are not pressed . ▪ Axis 1 is fully moved to one direction [255 / 0]. ▪ Axis 2 is fully moved to one direction [255 / 0]. ▪ Axis 3 is fully moved to the opposite direction [0 / 255]. ▪ Axis 4 is fully moved to the opposite direction [0 / 255]. ▪ Axis 5 is fully moved to the opposite direction [0 / 255]. ▪ Axis 6 is fully moved to one direction [255 / 0]. ▪ Axis 1 is fully moved to one direction [0.0]. ▪ Axis 2 is fully moved to one direction [0.0]. ▪ Axis 3 is fully moved to the opposite direction [255.255]. ▪ Axis 4 is fully moved to the opposite direction [255.255]. ▪ Axis 5 is fully moved to the opposite direction [255.255]. ▪ Axis 6 is fully moved to one direction [0.0].